Kolkata Police Commissioner Rajeev Kumar cannot be arrested but has to cooperate with the investigations into the Saradha chit fund scam, the Supreme Court said on Tuesday, with both West Bengal Chief Minister Mamata Banerjee and the Centre claiming that the directive was a "moral" victory. Kumar would have to make himself available before the investigating agency, namely the Central Bureau of Investigation (CBI), and "faithfully" cooperate at all times. To avoid controversy, however, the location has been fixed as the agency's office in Shillong, Meghalaya. A three-judge Bench led by Chief Justice Ranjan Gogoi also issued a notice to the chief secretary, DG and police commissioner to file their replies on or before February 18. On consideration of the replies, the court may require the personal presence of the officers on February 20, the order said. Appearing for the CBI, Attorney General K K Venugopal alleged that the special investigation team (SIT) of the West Bengal police headed by Kumar was not handing over the complete documents. Some of the documents submitted by them were "doctored" and the SIT had not even sent the laptops and phones seized from the main accused, Sudipta Sen, in the case, Venugopal alleged. In its affidavit submitted before the court, the probe agency also said that it had in its investigation found incriminating evidence against senior police officials, as well as politicians, of the state. Terming it a breakdown of constitutional machinery, the CBI's lawyer said that the officers who had gone to probe Kumar were forcibly pushed inside buses and manhandled by police officials of the state. West Bengal's counsel, senior advocate Abhishek Manu Singhvi, in his submissions, however, said that CBI's actions were an attempt to harass the state government. Raising a question on the urgency being shown by the CBI, Singhvi said that there had been no first information reports (FIRs) filed in the case over the past five years and hence, the current action was just to "score a point". Banerjee addressed the media shortly after the apex court order and said it was a victory of the people, the Constitution and Democracy. Later in the evening, she called off the dharna, which was in its third day. 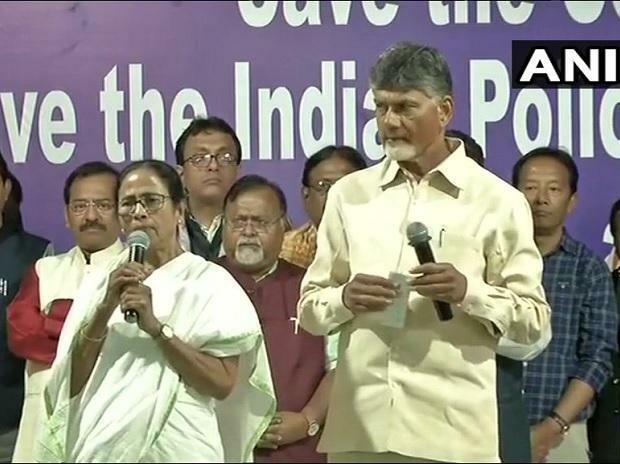 Flanked by Andhra Pradesh Chief Minister Chandrababu Naidu on the dharna stage, Banerjee announced that after discussions with all other political leaders, it had been decided to call off the dharna. "The order is a victory. Next week, a political programme will be carried out in Delhi," she added. Law Minister Ravi Shankar Prasad also described the Supreme Court order as a great moral victory. In keeping with the order, Commissioner Kumar has already written to the CBI that he would be available on February 8 in Shillong for questioning. Meanwhile, Home Minister Rajnath Singh is understood to have written to the government that action should be taken against Rajeev Kumar as he had joined the dharna. Banerjee, however, refuted the claim and said that Kumar had never joined the dharna. In a counter-offensive, Banerjee on Tuesday flashed a letter by Sudipta Sen, the Saradha group promoter, to the CBI in 2013. The letter mentioned that Rs 3 crore had been paid to BJP's Assam minister, Himanta Biswa Sarma. The minister responded in a tweet: "The frivolous & baseless campaign by @MamataOfficial Didi against me is very painful. I am not fortunate enough like your Police Commissioner. I've joined the investigations and offered my full cooperation as a witness. And all this happened much much before I joined @BJP4India." Banerjee appeared to be in top spirits through the day after the Supreme Court order and was heard breaking into a patriotic song -- Aye Mere Watan Ke Logon -- at one point. On the Supreme Court's clear directive that no coercive steps, including arrest, shall be taken against the commissioner of police, Banerjee said, "We are so obliged. Thank you so much. This will raise the morale of the police force."